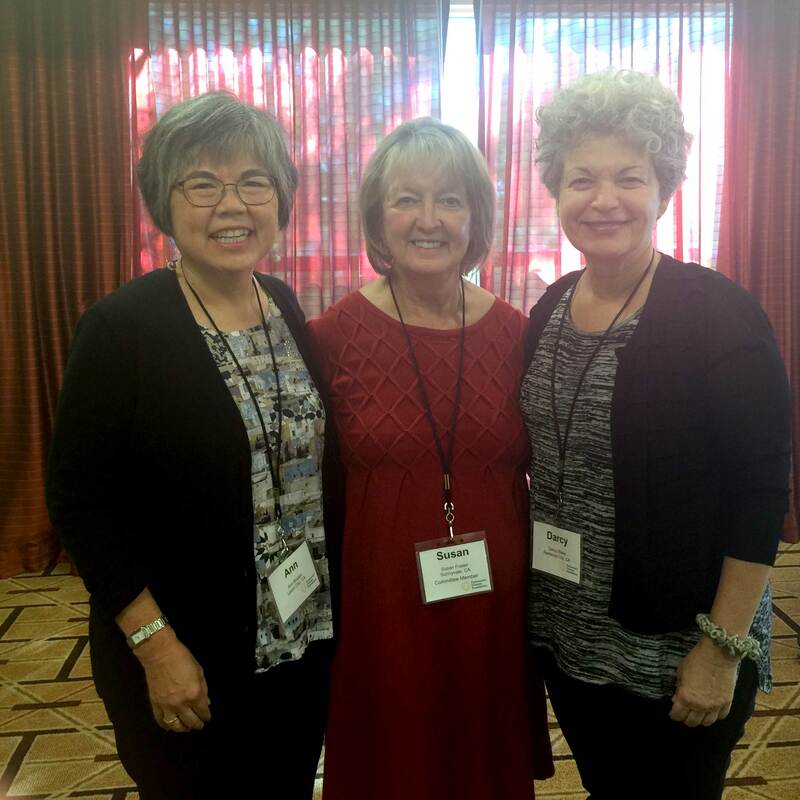 The Parkinson’s Disease Foundation’s Women & PD Conference in New Jersey hosted 25 women from all over the country. This is the first national, coordinated effort dedicated to improving the health and well-being of women living with Parkinson’s disease. Women with PD were selected based on their prior involvement with PD initiatives, and their communication and leadership skills. Susan Foster was one of four women on the Leadership committee who worked together for over a year to organize the conference. Ann Boylan and I were the lucky attendees from the Bay Area. The goal of the conference was to educate this core group of women on the issues facing women with PD. These women, in turn, will organize an event for women in their area. Dr. Allison Willis, Assistant Professor of Neurology at the Perelman School of Medicine, University of Pennsylvania spoke on the topic “Women and PD: What Do We Know?” Dr. Willis, who has spent years creating and conducting studies based on Medicare data, explained that we are very short on clinical studies for PD that focus on women. She showed us her work on gender differences in PD, supported primarily by the NIH NINDS (National Center for Research Resources and National Institutes of Health Roadmap for Medical Research.) With the aid of maps, graphs, and statistics, she explained facts and questions that transcend known studies that the male/female ratio for PD is 3:2, and that women have a survival advantage. That said, a significantly higher percentage of white, Hispanic, and Asian men are more likely to see a neurologist for PD than females. Trailblazer Dr. Willis sets a high bar for PD research. Her work indicates that there’s a lot more to women’s stats—in numbers and outcomes—than what’s been published. It was the perfect time for Dr. Becky Farley to jump in with some power up exercises to take the heat in the room down a notch! Becky Farley, PF, MS, PhD, Founder, Parkinson’s Wellness Recovery (PWR!) has established her brand for exercise accomplishment not only in the Bay Area, but all over the country. Her PWR! Vision is for people with Parkinson’s to belong to communities where individuals with Parkinson’s disease have access to “Exercise as Medicine.” When she says “power up,” her exercises make a world of difference to the well-being of people with Parkinson’s. Meaningful involvement was the perfect introduction for Diane Cook, Developer and Facilitator of the Parkinson’s Self-Efficacy Program. Diane’s program should be offered to every newly-diagnosed PD person. Her presentation examined self efficacy, or as Cook phrases it, “Achieve influence over conditions that affect one’s life. Believe in possibility!” She quoted her former employer, author and public speaker Deepak Chopra, who said “pay attention every day to your intention. Nothing is impossible.” Self-efficacy may be one of our most important tools for improving quality of life in Parkinson’s disease patients, so that they can manage the continual challenges of a chronic, progressive disease. Dr. Rebecca Gilbert, MD, PhD, from the Division of Movement Disorders, NYU Langone is an incredible, brilliant speaker who spoke about “Developing a Comprehensive Care Plan.””Become a force for good, don’t wallow,” she said. Dr. Gilbert, who covered every aspect of medications, symptoms and future developments, also answered a flurry of detailed questions from the educated audience without hesitation. She is like a key to the library of Parkinson’s disease! After a dinner with some great laughter thanks to the humor of Parkinson’s Disease Foundation Research Advocate and NPR radio celebrity Robin Morgan and some soul lifting by author of Parkinson’s Diva, Maria De Leon, MD, each attendee was given two books: Parkinson’s Diva by Maria De Leon and The Peripatetic Pursuit of Parkinson’s Disease by the Parkinson’s Creative Collective, graciously given to us by Katherine Huseman. Our group of 25 women had half a day left to come up with the next step – what to do next. After brainstorming, we each formed the beginning of a plan for what we’d do in different locations of the country. Each of us has vowed to do something for women & PD in our area. The experience for each attendee was like putting together a beautiful puzzle to be able to finally connect people with their stories. The 25 attendees at the Parkinson’s Disease Foundation Women & PD Conference are a remarkable bunch. Robin Morgan said the attendees had amazing energy enough to light a city block! Sharon Krischer, an attendee from Beverly Hills, CA. writes a blog Twitchy Woman’s Adventures with Parkinson’s Disease @ skrischer.wordpress.com that provides more info on the conference. Maria DeLeón’s blog defeatparkinsons.com has additional information on the conference. Roberta Marongiu, PhD, an attendee and a researcher from Rome, Italy focuses on women with PD. By chance, she mentioned the name of her neurosurgeon boss, Dr. Kaplitt, an internationally recognized expert in gene therapy. Coincidentally, he is the CSO of Circuit Therapeutics – whose film on Optogenetics I was in earlier this year! Robin Morgan likes PDF because they’re all about empowering the patient, and I would have to agree. PDF plus 25 women means magic! I am truly honored to have spent three days in the company of such strong women. Thank you PDF for the experience! Fabulous summary. Let’s keep the connections strong. Everyone gets their own version of PD, sorry to say. Some symptoms may be similar, but there are many versions of this disease!